Welcome to 2018 and welcome back to the Eye of the Fish, the uniquely Wellington look at architecture and urban matters in and around our glorious and perfectly formed small city – the self-proclaimed Coolest Small Capital in the World. The holiday season is now half over, and while you have been at the beach or up on a mountain top, some other people have been very busy. First up: down at Centre Port, the Harbour Quays office park development has been having a reduction in the number of buildings. 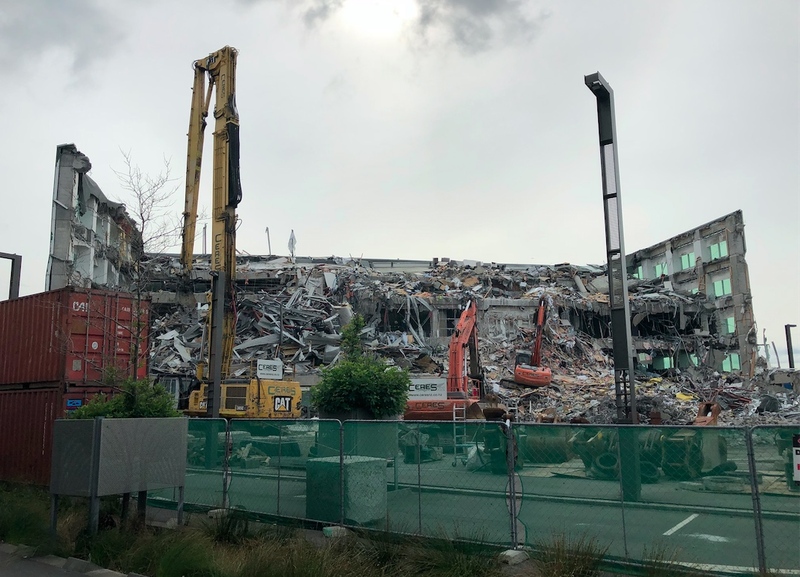 Yes, that is the much-mentioned “Stats House” or the former home of the Department of Statistics, now being reduced unceremoniously to rubble. Don’t blink or you’ll miss it. Actually, no one will miss it really – an uninteresting rectangular green box, the most interesting part of the building was the colonnade of columns up on the roof at plant room level, and the little skip up of the roof on the top floor – apart from that, it was just a box full of numbers. And such was the rush to demolish it that the building was destroyed, desks, computers, furniture and all, smashed into smithereens and then pulverised into many pieces and loaded into trucks on the way to the dump. The architects were Jasmax and engineers were Dunning Thornton, from memory, with Fletcher Construction as the lead contractor – but I suspect no one is going to be shining a spotlight on that in their portfolio in future. The guys driving the destructing machinery are true artists at their machines – reducing the inside to pieces while not even breaking a pane of glass on the outside. All credit must go to the cladding installer for such a well designed facade, even if it is shortly going to be slivers – it stood up to the thumping and crashing of the diggers and crunchers – and soon the mangled remains of the aluminium and the steel will be sorted into trucks and sent for recycling. 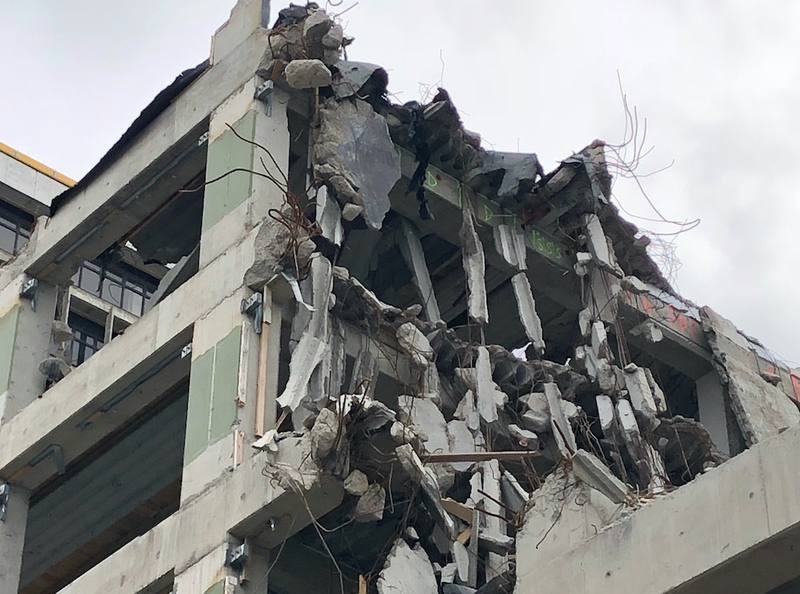 There has been another prominent building under demolition these holidays as well – the former headquarters of the New Zealand Defence Force. This building was designed by CCM – or Craig Craig Moller as they once were – but I don’t know much more about it – actually, none does, as it was all a bit top secret going up. Not quite so top secret going down. Observing the demolition crews at work, this building appeared to be made a lot stronger than the Stats building. The giant crunching machine they had at work on it before Christmas appeared to be making heavy work of eating the concrete, whereas the Stats building appeared a lot more edible. But readily crunchy or not, Defence is down and out. Below, we can possibly see one of the reasons why. Cracking in the ends of the main structural beams. 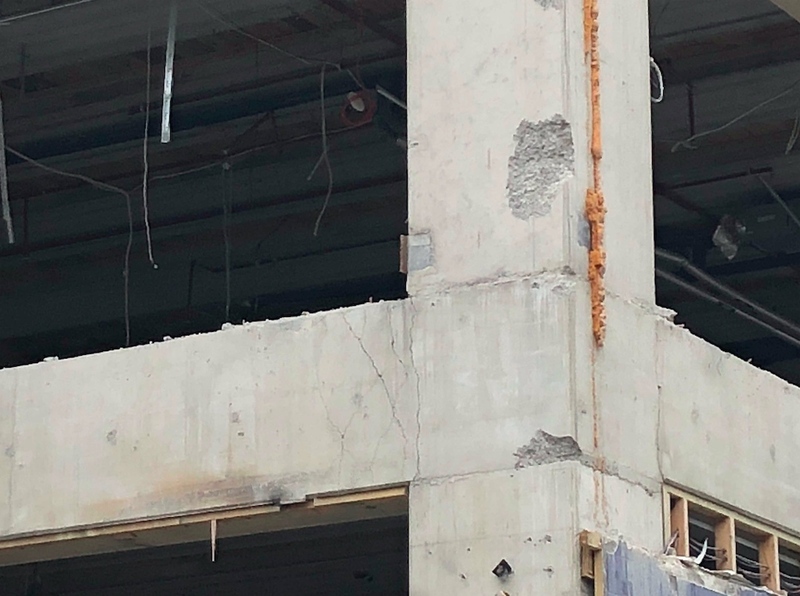 That doesn’t mean that the building was in any immediate danger of collapse, but does show the incredible stress these joints were under in the Kaikoura quakes a year ago. Racked back and forward, the building stiffness weakened at the beam junctions (as it should) and the steel in there is probably a little fatigued. My guess is that if another building is ever to be built on this site (as it surely will be) then it will be 100% more likely to have base isolation, as it should have done right from the beginning. What is kind of extraordinary is that this site, up on a hill overlooking the harbour, should have suffered the same ground acceleration movements as the reclaimed land down at Harbour Quays. Certainly I think there is a lot more doubt that the buildings at Centreport will ever get rebuilt. Their short-lived foray into property development may well be over, I think, with just one building remaining unscathed: the Customhouse. 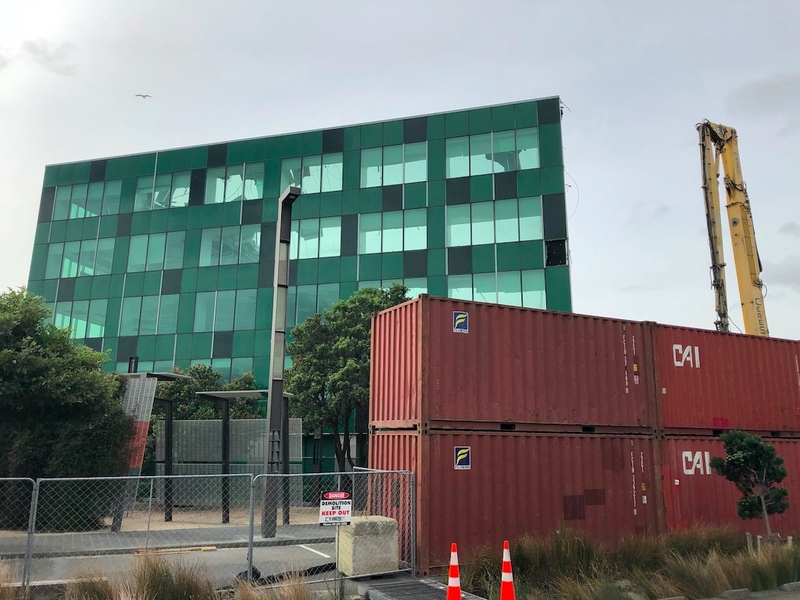 The other building down near the water is of course the BNZ – which can hardly be called unscathed, having been badly hit twice, and still unoccupied. More logs, vicar? Looking ahead to projects getting built, and ignoring the waterfront just for a moment, I thought you might like to see a couple of photos of some recent progress on part of the whole Transmission Gully thing. 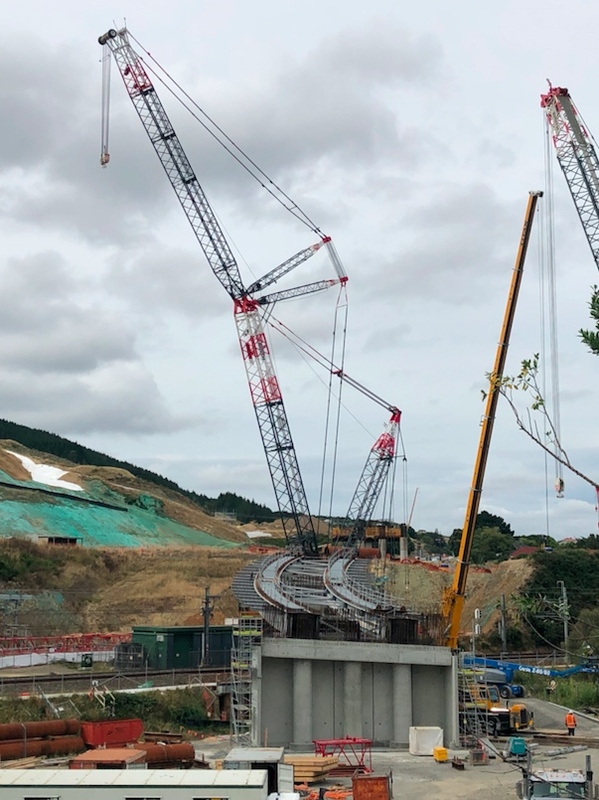 Although not strictly part of the TG itself, and more part of the Link Road for Porirua, over Christmas a massive crane was moved into position and four giant curved beams were raised up into place, with two over the Porirua Stream and two over the Kapiti line railway. Works are proceeding at pace to get other bridging columns in place for more giant beams over the existing motorway itself. These photos make it look like it has a very steep and downwards curve over the stream/railway, but that is probably due to foreshortening. 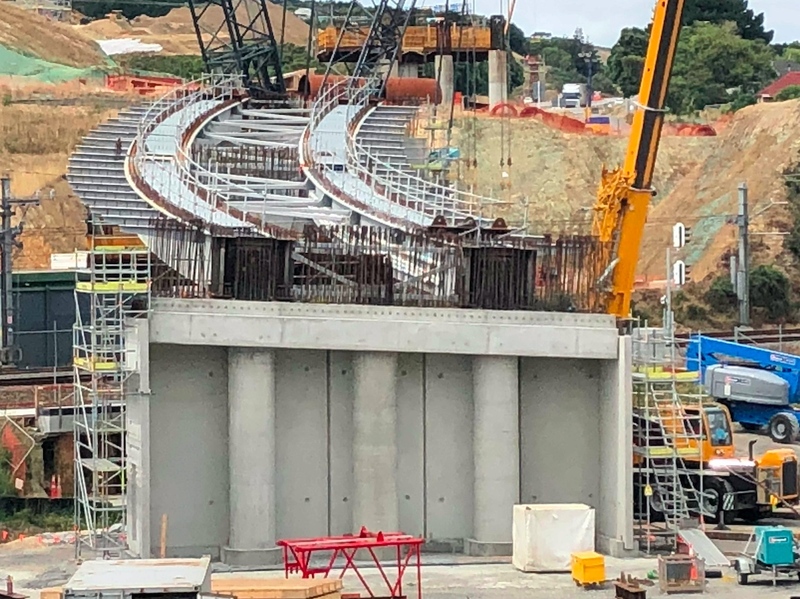 None the less, this is only one small part of a huge and complex interchange that will connect direct to Kenepuru Drive and the Porirua Hospital, as well as being the main off ramp for Porirua from the new T Gully route of SH1 itself. Post-script: I forgot to say: Stats is far from the only building to have been knocked down at Harbour Quays over the last year. There have been several others, none of them worthy of note really, apart from the biggest brick shed (shed 39 ? 35 ?) which had a certain stately splendour – but as you well know, unreinforced brick masonry is not your friend, and so down it went. Other buildings to have bitten the dust there, without even being acknowledged in the local press, was the NZ Rugby Union building, the old Adlams European building (the Citroen dealer), several old storage shed buildings by the railway line (all concrete framed), and the whole area is now wide open…. for what? New buildings? I think not. More logs? Quite likely. A wall of containers? Equally possible. But what about something else instead? A park, perhaps? For people? How about that ! A lovely photo of the Defence Building, mid-demolition, and looking like a scene from Baghdad, was taken today by Jacqui B and posted on FlickR. The timing of the demolition had been decided in conjunction with other users of the port land, including Greater Wellington Regional Council – CentrePort’s majority owners – Bluebridge Ferries, which operates from near Statistics House and Customs NZ, which recently began moving back into its headquarters, Customs House, which also suffered damage in the 2016 quake. 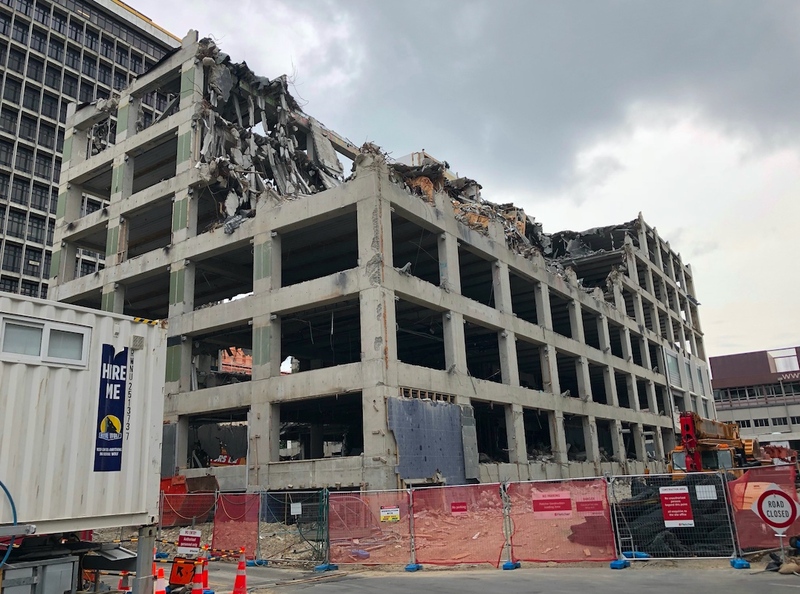 The fate of CentrePort’s other major commercial building, which was previously used by BNZ as its principal building in the capital, remains unclear, with Delaney saying talks were continuing with insurers. 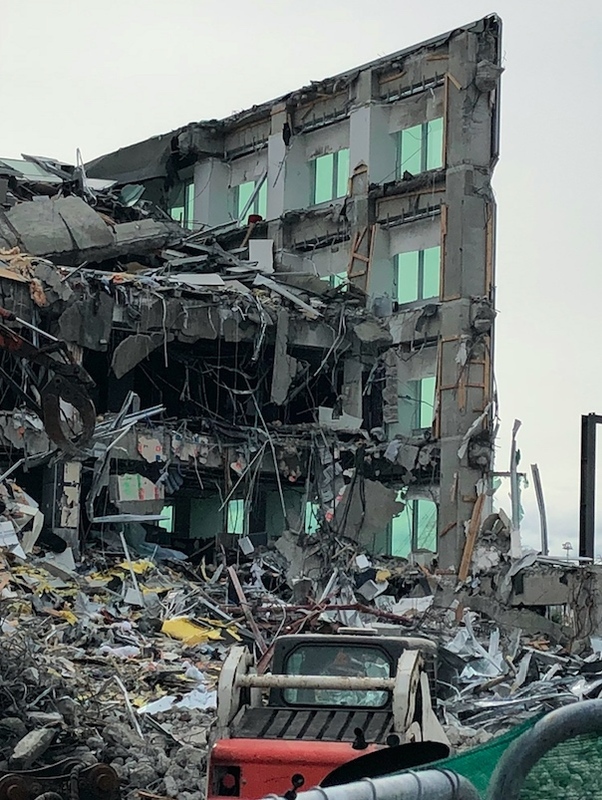 CentrePort was developing a plan of what it might do with the land cleared with the demolition of a number of its earthquake damaged buildings, and it was unclear whether this would involve new buildings, Delaney said. Not sure if you have seen the article online today – looking back to 2004, when a “Parisian boulevard ” was planned for the land down at the port. Unrequited dreams…. I’m not sure I can so readily associate Kerry Prendergast with Baron Haussman, but it is interesting to look back at the attraction this end of town has held for would-be social and urban engineers. Off the top of my head I can recall a casino makeover for the station; Athfield’s MoNZ in the post office; a massive residential/retail complex over the railyard; Kerry’s own ice skating rink; and, of course, the glorious vision of the CentrePort office park – an address Wernham Hogg themselves might aspire to. All ultimately standing on shaky ground. Starkive – you’ve clearly got a better, longer memory than I have! a MONZ in the post office? That’s news to me! And I remember a casino down near the lagoon, but not one near the railway station – when was that proposed? But of course you missed out the best of them all – a little closer to the south end of the boulevard – a proposal to move the St Johns building, away from the road edge, and use the back side to screen movies on, as a giant outdoor cinema screen. I haven’t heard a peep about that project for years! I assume you are referring to the Wellington Free Ambulance Building and the long-lost plan to turn it into a museum of the moving image at no cost to the ratepayer. Moving it was entirely the idea of whatever entity was attempting to monetise the waterfront at the time – something to do with Plan 17 From Outer Space, I think. Instead we ended up with a(nother) watering hole and a dilemma about how much money we should spend on a film museum a block or so away. “You were involved with that last minute Mainzeal attempt to produce a cheap alternative to Te Papa, by revamping the Post Office building on Waterloo Quay. Do you thank your lucky stars these days that nothing ever came of that?